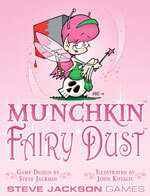 Fairy Dust is a 15-card expansion for classic Munchkin. It introduces the Sparkly Good Fairy and her deck of Fairy Dust cards â€“ extra rewards for munchkins who are willing to help each other. (It's perfectly munchkinly to be nice . . . as long as you get something cool for doing it!) Every card in the set is full-color, with added glittery pink and silver Fairy Dust. Fairy Dust is a finseal pack, sold to stores in a POP of ten packs. All packs contain the same 15 cards.